Progressive Field is the site of the matchup between the Chicago White Sox and the Cleveland Indians on Saturday, September 30, 2017. The probable starting pitchers are Carson Fulmer for the White Sox and Corey Kluber for the Indians. Chicago opens at +125 while Cleveland opens at -135. The White Sox have a 75-78-6 over/under record and a 86-73-0 run line mark. The Indians are 81-78-0 against the run line and have a 60-89-10 over/under record. The White Sox have a 66-93 overall record this season. Starting pitcher Carson Fulmer has a 2-1 record with an earned run average of 4.42 and a WHIP of 1.31. He has 17 strikeouts over his 18.1 innings pitched and he's given up 13 hits. He allows 6.4 hits per 9 innings and he has a FIP of 6.1. The bullpen has an earned run average of 4.37 and they have given up 490 base hits on the year. Teams are hitting .241 against the bullpen and they've struck out 502 hitters and walked 234 batters. As a team, Chicago allows 8.8 hits per nine innings while striking out 7.6 batters per nine innings. They are 25th in the league in team earned run average at 4.79. The White Sox pitchers collectively have given up 1,367 base hits and 744 earned runs. They have allowed 241 home runs this season, ranking them 2nd in the league. Chicago as a pitching staff has walked 613 batters and struck out 1,178. They have walked 4 men per 9 innings while striking out 7.6 per 9. They have a team WHIP of 1.42 and their FIP as a unit is 5.17. As a team Chicago is hitting .258, good for 13th in the league. The White Sox hold a .420 team slugging percentage and an on-base percentage of .316, which is good for 22nd in baseball. They rank 14th in MLB with 8.8 hits per game. Jose Abreu is hitting .306 with an on-base percentage of .356. He has 187 hits this season in 611 at bats with 102 runs batted in. He has a slugging percentage of .556 and an OPS+ of 142. Tim Anderson is hitting .260 this year and he has an on-base percentage of .280. He has totaled 151 hits and he has driven in 56 men in 580 at bats. His OPS+ is 83 while his slugging percentage is at .407. The White Sox have 1,395 hits, including 252 doubles and 184 home runs. Chicago has walked 398 times so far this season and they have struck out 1,365 times as a unit. They have left 1,039 men on base and have a team OPS of .735. They score 4.42 runs per contest and have scored a total of 702 runs this year. Cleveland has a 100-59 overall mark this year. With an earned run average of 2.27, Corey Kluber has a 18-4 record and a 0.86 WHIP. He has 262 strikeouts over the 198.2 innings he's pitched. He's also given up 135 hits. He allows 6.1 hits per nine innings and his FIP stands at 2.51. The bullpen has an earned run average of 2.93 and they have given up 406 base hits on the year. Teams are hitting .226 against the Indians bullpen. Their relievers have struck out 532 batters and walked 146 opposing hitters. As a team, Cleveland allows 8 hits per nine innings while striking out 10.1 batters per nine innings. They are 1st in the league in team earned run average at 3.34. The Indians pitchers as a team have surrendered 1,250 base knocks and 525 earned runs this season. They have given up 161 home runs this year, which ranks 30th in Major League Baseball. Cleveland as a staff has walked 403 hitters and struck out 1,582 batters. They give up a walk 2.6 times per 9 innings while they strike out 10.1 per 9. Their team WHIP is 1.17 while their FIP as a staff is 3.35. As a team, they are batting .264, good for 5th in the league. The Indians hold a .452 team slugging percentage and an on-base percentage of .339, which is good for 3rd in baseball. They rank 9th in MLB with 9.0 hits per contest. Francisco Lindor comes into this matchup batting .278 with an OBP of .339. He has 178 hits this year along with 88 RBI in 641 AB's. He maintains a slugging percentage of .513 with an OPS+ of 118. Edwin Encarnacion is hitting .261 this season and he has an OBP of .380. He has collected 142 hits in 545 at bats while driving in 104 runs. He has an OPS+ of 129 and a slugging percentage of .508. 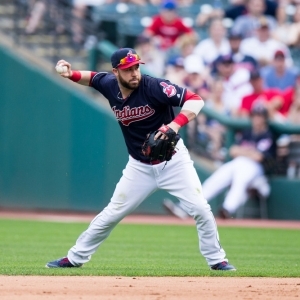 The Indians as a unit have 1,432 base hits, including 326 doubles and 211 homers. Cleveland has walked 585 times this year and they have struck out on 1,138 occasions. They have had 1,135 men left on base and have an OPS of .790. They have scored 5.06 runs per game and totaled 804 runs this season.